Transparency Market Research (TMR) observers the global multi-factor authentication market has a highly fragmented vendor landscape. The presence of numerous companies in the market is expected to further fragment the market. Some of the companies operating in the multifactor authentication market are Gemalto, EMC, Entrust, and Vasco. These players are increasingly taking part in business activities such as collaborations and mergers & acquisitions. Additionally, they are focusing on product innovation and improvement. 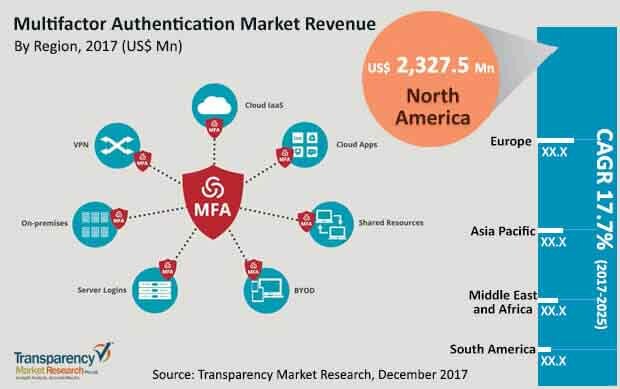 According to the report from TMR, the global multifactor authentication market pegged the value of US$4,829.2 mn in 2016 and is expected to attain a value of US$20,444.9 mn by the end of 2025. The market is anticipated to expand with a CAGR of 17.7% over the forecast period from 2017 to 2025. Based on models, the two-factor authentication model segment is expected to dominate the global multifactor authentication market. On the basis of region, North America is expected to dominate the global market for multifactor authentication owing to the high acceptance of multifactor authentication systems due to rising security concerns. The global multifactor authentication market is gaining traction due to soaring demand owing to the growing necessity for better security solutions. Multifactor authentication models are principally used for ensuring the safety of the sensitive information, which is paramount importance. Thus, the governments, finance, and banking sectors are increasingly adopting the module to secure their important files, data, and information. The multilayered authentication system is established and works on the considerations of possession, genetics, location, and knowledge. Ownership requirements include tokens including OTP, keyfob, and others. Some other parameters that are based on genetic factors that include fingerprint, facial biometric, and retina scan. These layers make the system more secure and location-based factor adds an extra layer of verification. These layers ensure the safety of the money transaction and data security, which in turn, is propelling its adoption for data protection. This is a key factor in boosting the growth of the global multifactor authentication market. Additionally, the adoption of these models is leading to surging investment in the research and development (R&D) for improving security for projects. Furthermore, a growing cyber-attacks is expected to increase thrust for multifactor authentication models, which is another factor propelling the growth of the global multi-factor authentication market. Moreover, some of the stringent rules and regulations imposed on the numerous governments globally in order to ensure the safety of national secrets is augmenting the demand for security measures and propel the growth of the global multi-factor authentication market. However, the initial high cost and investment for installation of the authentication models posing as challenges to the growth of the global multifactor authentication market.